A termite infestation is a really huge serious problem for any Arizona homeowner, and it usually isn’t something that will just go away without some kind of treatment. There are four main subgroups of termites that is located in Arizona, the most common are the desert termites. These termites can be found around cactus and any other desert plants, and while they do not often invade homes they can still do a lot of other damage when they do. Arizona termites are active throughout the year, but they are the most active in the month of August and the early fall. The weather during this time is not too hot or too cool, so termites are more likely to explore along the walls of homes to see if they can find any wood. Despite the fact that termites are at their most active during the late summer, an infestation will not go away just because their peak season has ended. They can remain in a home from days to years, and in many cases they go unnoticed until significant damage has been done to the home. Termites are particularly vulnerable to heat, and it is likely that they will be harder to detect during the dry summer months on the year. However, this does not mean that you need to put off treating your home of repellents until the months of August or September. You may notice better results during this time, but you can still do something about the termite infestation that you may have in your home in the months of June or July. If you need to replace any wood that has been damaged by termites, the middle of the summer might be the best time to replace damaged wood. You are less likely to experience a new infestation during the hotter months of the year, and if you can replace your soft or damaged wood with something that has been treated to withstand damage, you could prevent an infestation before it begins and continues to grow. Keep in mind that termite control is not something you should attempt yourself or try diy videos off of YouTube. Termites are persistent pests, and they can keep coming back if you do not hire a professional to deal with the problem. If you suspect that your home has a termite infestation at any time during the year, seriously do not hesitate to call an exterminator near you. 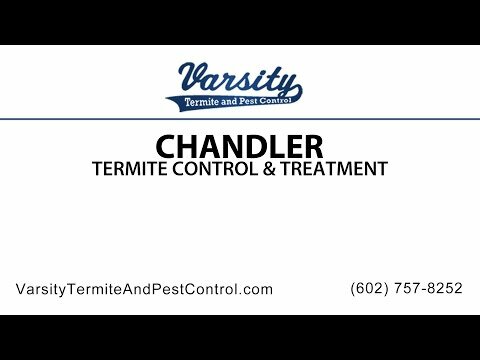 Varsity Termite and Pest control located in Arizona has professional exterminators that will be glad to help you with any needs you have! Varsity also provides a scorpion and pest control in Chandler service. If you have any questions or concerns about termite control in Chandler, please call us for more information. Or you can explore our website with more knowledge about termites as well.